Using Bitmanagement’s ‘Geometry Instancing Node’, multiple copies of the same object are rendered in one unit. This technique is mainly for objects such as trees, grass, or buildings that contain recurrent geometries. Although a large number of added objects are utilized, the performance of the scene is not significantly affected as long as the hardware acceleration of current graphic cards in DirectX is used. 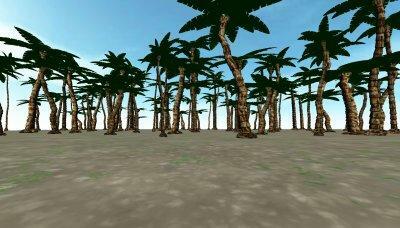 In 3D scenes, the more distant objects (e.g. trees), which are normally sketchily represented, can be now provided with a real geometry. In these scenes, the vegetation or other repeating objects in the distance have a better natural appearance. When using conventional methods, rendering many of these exampled objects goes hand in hand with a drastic loss of performance. However, when taking advantage of the Bitmanagement technique and the hardware acceleration of current graphic cards (e.g. ATI and Nvidia), the designer gets an improved graphic quality with almost no cost of performance. Please find more detailed information at http://www.bitmanagement.com/developer/index.html.